As contingency spacewalks go, the urgent task should be easy: a quick 2.5-hour run to swap out a failed backup computer that controls several systems on the International Space Station, including robotics. But NASA doesn’t want to go ahead with it until spare spacesuit parts arrive, in the aftermath of a life-threatening suit leak that took place last summer. Those parts are on board the much-delayed SpaceX Dragon spacecraft sitting on a launch pad waiting for its next window to open. For this and other reasons, NASA decided to move ahead with the launch as planned Monday at 4:58 p.m. EDT (8:58 p.m. UTC). The spacewalk would take place April 22 — if Dragon gets there as planned on Wednesday. “We need to get it [Dragon] on board as soon as we practically can,” said Mike Suffredini, the International Space Station’s program manager, in a phone briefing with reporters Sunday (April 13). That’s because Dragon is carrying a new spacesuit, components to fix an existing spacesuit, critical research experiments and food for the six crew members of Expedition 39. 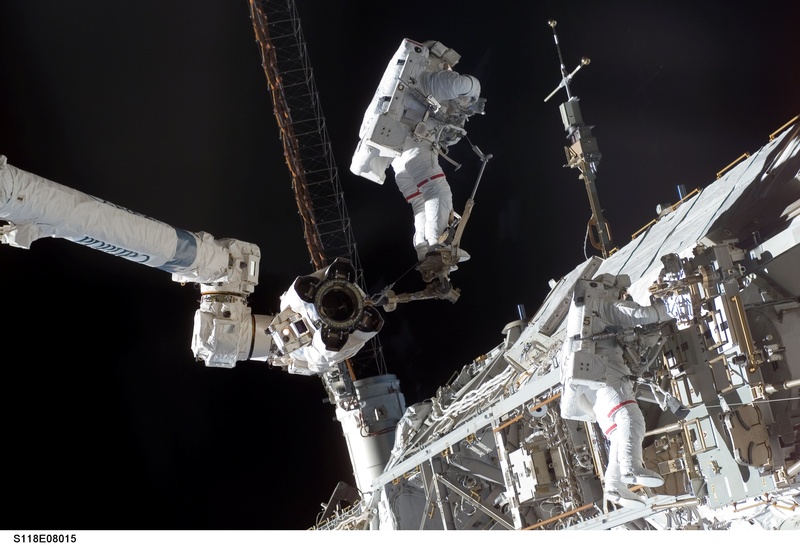 The challenge, however, is making sure the station could be ready even if the primary multiplexer demultiplexer (MDM) fails before spacewalkers can make the backup replacement. There are more than a dozen MDMs on station, but each one controls different functions. This primary MDM not only controls a robotics mobile transporter, but also radiators and a joint to move the station’s solar arrays, among other things. The computer sits on the S0 truss on station, which you can view in the diagram below. “The biggest driver for us is the positioning of the solar arrays as we look to the next failure,” Suffredini said. NASA needs to reposition the arrays when a vehicle approaches because plumes from the thrusters can put extra “loads” or electrical power on the system. At the same time, enough power must flow to the station for it to operate. Luckily, the angle of the sun is such these days that the array can sit in the same spot for a while, at least two to three weeks, Suffredini said. NASA configured the station so that even if the primary computer fails, the array will automatically position correctly. NASA also will move a mobile transporter on station today so that the station’s robotic arm is ready to grasp the Dragon when it arrives, meaning that even if the primary computer fails the transporter will be in the right spot. If Dragon is delayed again, the next launch opportunity is April 18 and the spacewalk would be pushed back. Dragon’s precious payload of items includes several intended to make NASA spacewalks safer. The suit leak was due to contamination in the fan pump separator of Suit 3011 that plugged a tiny hole inside the water separation part of the unit. Water then escaped and got into the helmet, causing a near-emergency for Luca Parmitano — who was using the spacesuit in July. NASA installed snorkels and absorbent helmet pads into its spacesuits while awaiting the results of an investigation, and also pushing back all nonessential spacewalks. The agency now has recommendations in hand and is addressing those with the hope of resuming non-contingency spacewalks this summer. Today, Suffredini also provided an update on what the contamination was. “The anomaly was the result of contamination introduced by filters essentially used to clean and scrub the water loops for us,” he said. The next spacewalk will use Suit 3011 (which got a new fan pump separator for contingency spacewalks in December) and Suit 3005, which will use the new separator on board Dragon. The cooling lines on spacesuits on board station have been purged with fresh water to reduce the silica buildup, and astronauts will use new filters that they know are clean. If for some reason Suit 3005 can’t be used, Suffredini added, the new suit could be put in place instead after some testing to make sure it’s ready. “We’re in a very good posture for the EVA [extra-vehicular activity],” Suffredini said. NASA hasn’t decided who will go on the spacewalks yet, he added. There are at least two or three spare MDMs on station; the one needed for this particular spacewalk is inside the U.S. Destiny laboratory, which is handily right next to the S0 truss and spacesuit worksite. Of the “big 12” repair jobs the astronauts train for, the MDM replacement is among the easiest, Suffredini said, adding astronauts never encountered an external MDM failure on station before. The last set of contingency spacewalks took place in December to replace a failed ammonia pump that affected science experiments on station. Expedition 39’s Rick Mastracchio was among the pair “outside” during those spacewalks. We will keep you apprised as circumstances warrant. Heck of a picture from 2016, though!